Srnicek became a fans' favourite during his first spell with the Magpies between 1991 and 1998. 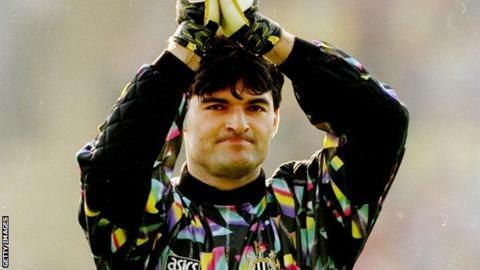 The funeral of former Newcastle and Czech Republic goalkeeper Pavel Srnicek will be held in his home town Ostrava on Monday, 4 January. Srnicek died on Wednesday aged 47, nine days after suffering cardiac arrest. After being placed in an induced coma, his life support machine was switched off after brain scans showed "irreversible damage", said his agent. Funeral services, to which friends and colleagues are invited, will be at the Ostrava Vitkovice house of mourning. Srnicek became a big favourite with Newcastle fans during his first spell at St James' Park between 1991 and 1998. He returned to the club on a season-long deal in September 2006 but was released in May 2007 after making 190 appearances across his two spells. Srnicek also played for Sheffield Wednesday, Portsmouth and West Ham in England, and made 49 appearances for his country.